The Oregon men’s basketball team is currently in a dogfight for the PAC-12 title and, barring a total meltdown, will almost certainly reach the NCAA tournament in March. How far into the tournament can this team go? That same question was being asked in 1960. The 1958-1959 version of the Ducks basketball team had not fared well, finishing with a 9-16 record. The one highlight of that season was a victory over California, who went on to win the 1959 NCAA championship. Despite the losing record, Oregon returned most of its key players for the 1959-1960 season. The returning veterans were bolstered by five sophomores off the undefeated (13-0) freshman team. The usual starting lineup featured Glenn Moore at center, forwards Dale Herron and Charlie Warren, and guards Chuck Rask and Denny Strickland. The bench included front court players Bill Simmons, Stu Robertson, Wally Knecht, and Jerry Anderson. Depth in the back court was supplied by Butch Kimpton, Leon Hayes, and Jim Granata, and the Ducks were coached by Steve Belko. He was assisted by Don Kirsch, the head baseball coach, and Phil McHugh served as freshman basketball coach. Bob “Two Gun” Officer was the team’s trainer. The 1959-1960 season was Oregon’s first as an independent following the demise of the Pacific Coast Conference. There were both advantages and disadvantages to playing as an independent. However, the biggest advantage was that a successful season would make it easier to secure a berth in the NCAA tournament. Fresno State was Oregon’s first opponent of that season, and two games were scheduled, one to be played on Friday, the second on Saturday. This arrangement occurred several times throughout the season. In the case of Fresno State and San Jose State all the games were played in Eugene at McArthur Court. The Ducks also played back-to-back games with Oregon State and Portland State, although the Friday games were played on the opponent’s home court and the Saturday games at Mac Court. Oregon easily handled the Fresno State Bulldogs, led by the scoring and rebounding of Moore. Next up was the inaugural Treasure State Classic in Bozeman, Montana. Oregon’s first opponent was the hometown Montana State Bobcats. That game was also the Ducks’ first loss of the season. It was a game Oregon should have won but lost because of the hometown officiating that provided the Bobcats with many more free throw attempts. Four Ducks fouled out of the game. (Note: reportedly, Oregon Athletic Director Leo Harris instructed Belko to never schedule a game with Montana State again. Belko followed that policy until the 1965-1966 season when the Ducks returned to Bozeman and inflicted a 29-point beating on the Bobcats.) Oregon won the tournament’s consolation game the following evening, beating the University of San Francisco Dons. A return to the friendly confines of Mac Court led to three wins over the Colorado State Rams and San Jose State Spartans. Several days later, the Ducks participated in the fourth Far West Classic. What many fans probably do not recall is that for the first four years of that tournament games were played in Corvallis, not Portland. Not surprisingly, Oregon State had won each of the previous Classics. Oregon’s opening opponent was the Denver Pioneers, fresh off a victory over the Michigan Wolverines. Oregon beat the Pioneers by 17 points. Washington State was the Ducks’ second round opponent. Oregon dispatched the Cougars by a 15-point margin. However, it was a costly victory as Moore suffered an ankle injury that kept him out of the championship game. At 6-foot-7 Moore was Oregon’s tallest player. Oregon State was – you guessed it – the Ducks’ opponent in the championship game. This was the first of five games between the Ducks and Beavers that season. Without Moore to help offset the height advantage enjoyed by the Beavers, Oregon State prevailed 60-56. Rask and Warren were named to the All-Tournament team. January found the Ducks opening 1960 with home victories over Stanford and Washington State, followed by an away victory over Idaho. The win over the Vandals was followed by a road loss to the Cougars. This was a pattern that haunted the Ducks in 1960. Oregon would handily defeat a team at home but when playing on the same opponent’s home court would lose, often by a substantial margin. The 1959-1960 Ducks were 12-1 at home, but only 7-9 away from Mac Court. The only home loss was at the hands of Southern California. As the regular season wound down, Oregon was clearly in the hunt for an NCAA tournament berth. The only stumbling block was the final two Civil War games against the Beavers. The first game was played in Corvallis with the Beavers prevailing 53-45. Oregon State’s win gave it the Chancellor’s Trophy for that season, having won three of the five games played. The following night saw Oregon win, 67-63, in Eugene. Belko was carried off on the shoulders of his players. Oregon saw the regular season end with a 17-9 record. That record was the best in the Northwest and enough to secure a berth in the Big Dance. The NCAA tournament in that era was quite different than the current version. First, there were far fewer teams, with only 25 teams participating in the 1960 tourney compared to the sixty-plus teams these days. Second, teams played in the regions in which they were located. They were not sent to other regions as is the current practice. Third, for a team to get an automatic berth in the tournament it had to win its conference. In the Far West Regional, the only team with an automatic berth was Santa Clara of the West Coast Conference, the only District 8 conference with enough members to qualify for an automatic berth. Oregon opened the Far West Regional with a victory over New Mexico State in Corvallis. The next round, the ”Sweet Sixteen,” was played in Seattle. The Ducks opponent was the heavily favored Utah Utes, who had defeated USC in the first round. Oregon beat the Utes, 65-54, to advance to the “Elite Eight,” where they would face the defending NCAA champion California Bears. Unfortunately, the Ducks fell to Cal, 70-49. California advanced to the championship game again only to lose to an Ohio State team featuring future NBA stars Jerry Lucas, John Havlicek, and Larry Siegfried, as well future Hall-of-Fame-worthy coach Bobby Knight. 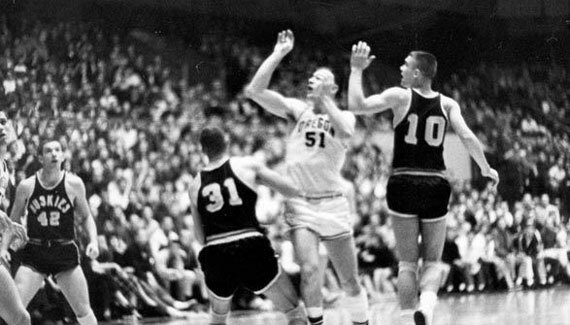 The Ducks returned to the Big Dance in 1961 only to lose in the opening round to USC. The Ducks did not make another appearance in the NCAA tournament until 1995. The 1959-1960 team and season had been a wonderful surprise for Oregon fans. Perhaps this season will see our Ducks reach the championship game that has eluded us since 1939. Top Photo courtesy of University of Oregon Libraries – Special Collections and University Archives.